The aluminum heads continue to impress and even more so on the engines built to be daily drivers. A case in point here is an aluminum headed 318 inch Ford Y-Block built for Jim Culver’s 1956 Ford Club Sedan. 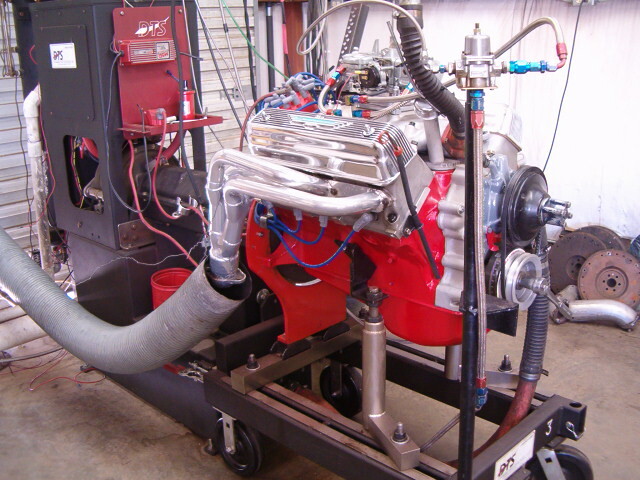 Once the noise from the dyno session had died down, Jim’s engine had peaked at 429 HP and 388 ft/lbs of torque. And this is from an engine designed to run on readily available pump gasoline and being a daily driver. The quick math on this combination is a 1.35:1 HP/CID ratio which is more than respectable. The foundation for this engine starts out as a 1967 date coded C2AE 292 block which is taken out to a +060” overbore. The only oil galley modification performed to this block is machining a groove in the center camshaft bore behind the cam bearing. This simply insures a constant supply of oil making its way up to the rockers even in the event the center cam journal groove presses itself into the cam bearing material. The mains are align honed and the decks are machined so that the piston tops are level with the decks (zero decked). The finished deck height for this particular block ends up being 9.750”. The crankshaft is an original 292 cast piece that’s offset ground to a 3.480” stroke with 2.000” journals. The main journal sizes end up being 0.010” under a standard 292 size. The connecting rods are 6.250” long Eagle H-Beams and required having their big end widths narrowed to fit within the 1.810” crankshaft journal widths. Other than the narrowing of the connecting rod big end widths, the rods remain relatively unmodified. The rod bearings being used are out of the box Clevite ‘narrower than stock’ pieces that did not require any modifications. The pistons are made by Wiseco and are sized for the 3.810” bore with a wrist pin compression height of 1.760” and use 0.927” wrist pins instead of the stock Y sized 0.912” pins. 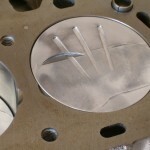 The rings are metric and are 1.5mm for both the top and second grooves and 3.0mm for the oil ring. Metric rings are used for the reduced surface area at the cylinder wall and also for the reduced radial tension by lieu of a reduced radial land thickness. 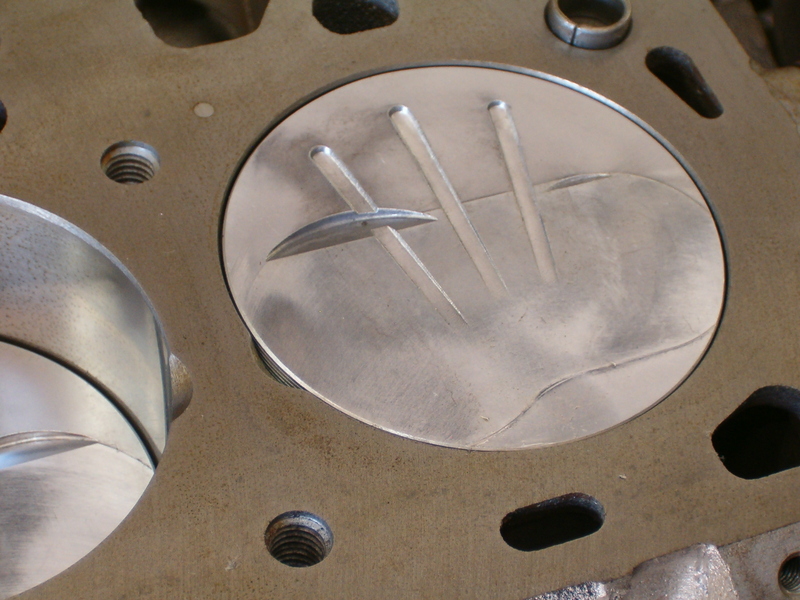 The piston top itself is a flattop design with a trio of anti-detonation slots added to their tops. The camshaft is a custom Isky symmetrical grind with the advertised duration being 270°, the 0.050” duration being 242° and the advertised gross lift with 1.6:1 rockers being 0.563”. The cam itself is ground on 107° lobe centers and is installed 2° advanced or at a 105° intake lobe centerline. The tappets are Hylift Johnson and are U.S. made. The 5/16” diameter pushrods are manufactured by Smith Brothers and these actuate a set of Harland Sharp 1.6:1 roller tipped rocker arms. A roller timing chain set keeps all the pertinent parts moving in the right directions. The heads are out of the box Mummert ‘ready to run’ aluminum units and measure out at 60cc’s for the combustion chamber volumes. 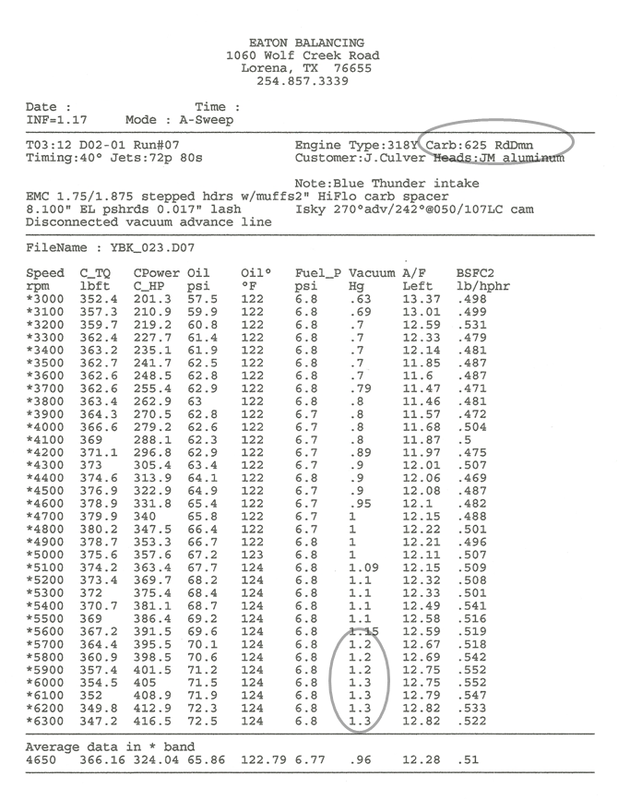 The static compression ratio for Jim’s engine is 10.0:1 while the dynamic compression ratio calculates to be 7.7:1. Best Gasket head gaskets are being used along with ARP head bolts to keep fluids and combustion pressures in their places. Unlike iron heads where the headers can be bolted up to the heads without any gaskets for dyno testing, the aluminum heads do require some measure of protection. For this a set of copper exhaust gaskets from ‘Relics Exhaust Gaskets’ were used as these can be used numerous times on dyno engines. The oil pump is a rebuilt aluminum gerotor pump from an early Sixties Y engine. The relief spring is shimmed an additional 0.085” which provides a solid ~65 psi of hot oil pressure under throttle. 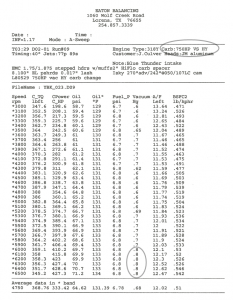 Low rpm oil pressure is still controlled by the bearing clearances themselves. The oil pan is an unmodified stock front sump unit with a factory equipped baffle. Valvoline 10W-40 oil (API SN rated) is used for the break-in with no additional additives being used. 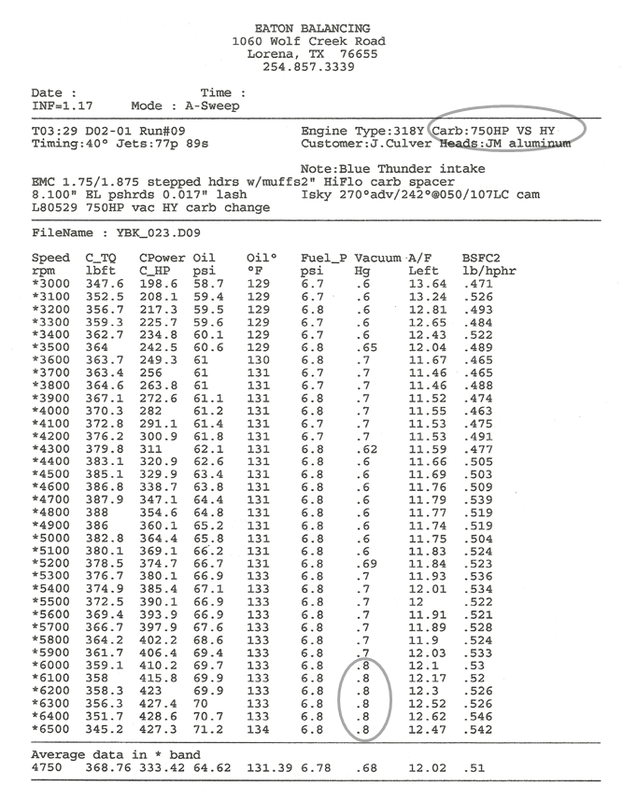 The ZDDP or zinc-phosphate amount in this particular grade of oil is adequate for flat tappet camshafts and still matches the ZDDP content in the older ‘SJ’ oils. When in doubt about the ZDDP content in a specific oil, pulling up the manufacturers MSDS (Material Safety Data Sheet) sheet typically gives the zinc amounts in that oil. On a side note, I’ve a list of over two dozen items that can cause cam lobe and/or lifter failure and any one of those items by itself can be a show stopper. Granted that the ZDDP content in the oil is one of them, it’s not near as catastrophic as many of the others. I’ll publish that list in a future article. 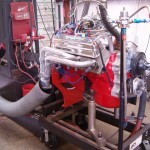 Two different carburetors were used during the dyno session. 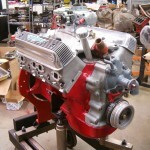 The carb off Jim’s 312 was a 625 cfm Road Demon while the other carb tested was a 750HP series Holley with List #80529-1. Both carbs incorporate vacuum secondaries. It was noted that in using the 625cfm Demon that the vacuum levels were increasing in the upper rpm band. This is typically a very good indicator of under-carburetion. In using the 750 cfm Holley (which actually flows in the 825 cfm range) the peak horsepower increased while at the same time the vacuum levels stayed more reasonable in the upper rpm band. The peak torque values also increased when using the larger cfm carburetor. 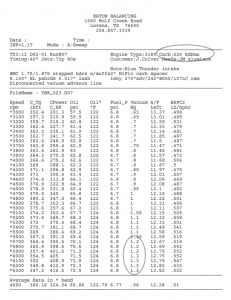 The dyno sheets for both carb tests are included at the conclusion of this article. Until next time, happy Y motoring. Ted Eaton. click on individual sheets for larger versions.